We’d love your help. Let us know what’s wrong with this preview of The Cuckoo and the Warbler by Kennedy Warne. 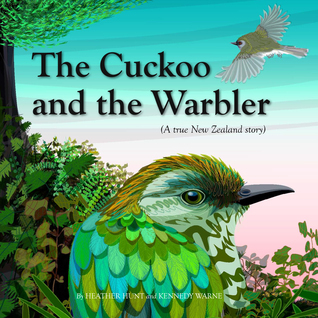 The Cuckoo and the Warbler tells the story of one of the most remarkable wildlife relationships in New Zealand, between pipiwharauroa, the shining cuckoo, and riroriro, the grey warbler. It is a story of tragedy, trickery and faithful care – and it plays out each spring and summer in the forests of Aotearoa. Although rarely seen by humans, the interaction of these two nativ The Cuckoo and the Warbler tells the story of one of the most remarkable wildlife relationships in New Zealand, between pipiwharauroa, the shining cuckoo, and riroriro, the grey warbler. To ask other readers questions about The Cuckoo and the Warbler, please sign up. This book blurs the boundary between fiction and non-fiction. Although it contains information about the shining cuckoo (pipiwharauroa) and the grey warbler (riroriro), it is presented in the form of an engaging story of struggle and deception. When the shining cuckoos return to New Zealand they seek out grey warbler nests in which to lay their eggs. Despite the difference in size and colouring, the grey warblers then raise the shining cuckoo baby as their own, while the cuckoo parents enjoy a ch This book blurs the boundary between fiction and non-fiction. Although it contains information about the shining cuckoo (pipiwharauroa) and the grey warbler (riroriro), it is presented in the form of an engaging story of struggle and deception. When the shining cuckoos return to New Zealand they seek out grey warbler nests in which to lay their eggs. Despite the difference in size and colouring, the grey warblers then raise the shining cuckoo baby as their own, while the cuckoo parents enjoy a child-free lifestyle. This extraordinary story is simply and ably told by Kennedy Warne, one of the founders of the New Zealand Geographic magazine, and beautifully illustrated by Heather Hunt. The drawings are slightly stylised renditions that sympathetically evoke the New Zealand bush and the two birds that are the protagonists of this story. world. It would also be of interest to keen artists.